Standing on the western bank of India's holiest river Ganges, Varanasi is the oldest surviving city of the world and the cultural capital of India. It is in the heart of this city that there stands in its fullest majesty the Kashi Vishwanath Temple in which is enshrined the Jyotirlinga of Shiva, Vishweshwara or Vishwanatha. Here gravitate the teeming millions of India to seek benediction and spiritual peace by the darshan of this Jyotirlinga which confers liberation from the bondages of maya and the inexorable entanglements of the world. A simple glimpse of the Jyotirlinga is a soul-cleansing experience that transforms life and puts it on the path of knowledge and bhakti. Vishweshwara Jyotirlinga has a very special and unique significance in the spiritual history of India. Tradition has it that the merits earned by the darshan of other jyotirlinga scattered in various parts of India accrue to devotee by a single visit to Kashi Vishwanath Temple. Deeply and intimately implanted in the Hindu mind, the Kashi Vishwanath Temple has been a living embodinent of our timeless cultural traditions and highest spiritual values. The Temple has been visited by all great saints- Adi Shankaracharya, Ramkrishna Paramhansa, Swami Vivekanand, Goswami Tulsidas, Maharshi Dayanand Saraswati, Gurunanak and several other spiritual personalities. The Kashi Vishwanath Temple attracts visitors not only from India but abroad as well and thereby symbolises man's desire to live in peace snd harmony with one another. Vishwanath being a supreme repository of this spiritual truth thus strengthens the bonds of universal brotherhood and fellow feeling at the national as well as global levels. On January 28, 1983 the Temple was taken over by the Govt. of Uttar Pradesh and it's management ever since stands entrusted to a Trust with Dr. Vibhuti Narayan Singh. Former Kashi Naresh, as president and an Executive Committee with Divisional Commissioner as Chairman. The Temple in the present shape was built way back in 1780 by Late Maharani Ahilya Bai Holkar of Indore. In the year 1785 a Naubatkhana was built up in front of the Temple by the then Collector Mohd. Ibrahim Khan at the instance of Governor General Warren Hastings. In 1839, Two domes of the Temple were covered by gold donated by Punjab Kesari Maharaja Ranjeet Singh. Third dome but was remained uncovered, Ministry of cultures & Religious affairs of U.P. Govt. took keen interest for gold plating of third dome of Temple. Nirvikar cahitanya and Sanatan Brahma have assumed the form of Saguna Vishwarupa from the initial Nirgun Roopa or form. The Shiva Shakti roopa became the Purusha (man) and Stree (the woman) again. Prakriti and Purusha (Nature and man) (Shiva-Shakti) were once ordained by Shiva to do tapas in the universe in order to create the best being. He specified the best place for this purpose. When a prayer was held, Nirgun Shiva, with His own powers and aura, created a wonderful city called Panchakoshi. Vishnu, who resided there, spent a lot of time praying to Shiva after which several watersprings originated there. Vishnu was amazed at this wonderous event, and even as he tilled his head, a gemstone fell from his ear. Because of this place, it was also called Manikarnika. The entire Panch Koshi area of Manikarnika waters were then gathered into the Trident by Shiva. Then from the navel of Vishnu was born a lotus flower with Brahma in it. Brahma was ordained by Shiva to create a world, at which Brahma created this wonderful world. It had fifty crore Yojanas of area and fourteen lokas. In order to save the lives of these who are bound by their own actions or karma. Shiva kept panchakoshi city away from the entire universe. 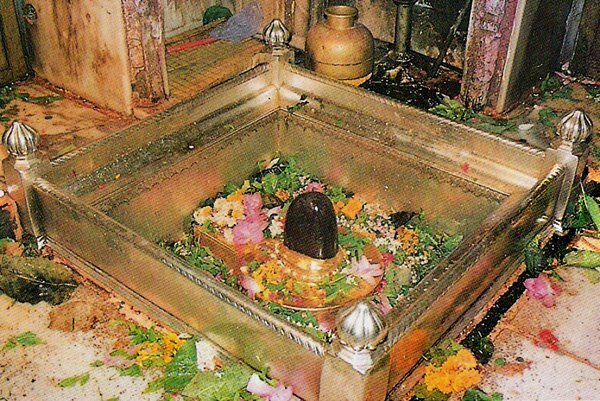 In this city, Shiva Himself established the saviour Muktidayak JyotirLinga, which He can never leave. Shiva removed this very Kashi from His Trident and set it in this mortal world. It was not to be destroyed when Brahma’s day ends, but during Pralay i.e., final destruction of the world, Shiva saved it by keeping it safe in his trident. So the kashi is called avimukta kshetra. In Kashi, the Avimukteshwar Linga is there forever. Those who can never hope for salvation, attain Moksha here. This holiest city of Panchakoshi, with its capacity to destroy every conceivable sin, is the vehicle of a special Moksha by the name “Samyugha”. That is the reason why this city which is ruled by Brahma, Vishnu and Mahesha, is the place, where even divines want to die. Sarwaguna from inside and Tamoguna from outside, are the qualities of Rudra here. When prayed to, Vishwanatha Bahagavan Sri Shankar made this abode and resided there with Parvati. Kashi city is the place for Moksha and Ganga. Those who live here attain Mukti or Salvation, even without having to travel to any place of pilgrimage. Any one, be it a man, woman, young, old, Sahava, pure or impure, Prasuta, Aprasuta, Swadesh, Andaja, Udibhaja, of whatever caste, all attain Moksha. There is not an iota of doubt in this. Whatever a person may be doing, eat, sleep or anything else, if he departs from this world from Avimukteshwar, he definitely attains Moksha. Any small act of goodness or Punyakarya, takes away all the sins. Good as well as bad people are born on this earth. But by living in Kashi, both attain Moksha. Later, several people came forward to build this temple. A king by the name Banar developed this city of pilgrimage. About one and half thousand beautiful temples were built here. The tower of the Vishweshwara temple is a hundred feet high. Kashi nagar is so great that even if the universe is to be destroyed in Pralaya, it would remain intact. Dandapani and Kalabhairav guard this city. They stay there forever. On the Ganga banks eighty four bathing ghats are located. There are also several teerthkundas. They have been there right from the times of Vedas. Varanasi, which was a pious place of pilgrimage for the hindus, soon became an eyesore and source of jealousy for the Muslims. From 1033 to 1669 AD Kashi came under several destructive attacks. Temples were demolished and Masjids built there instead. But due to the dedication of the Hindu devotees, the JyotirLinag pilgrimage place continued to develop. During the reign of the British and the Marathas, this place really developed well. Even the Jaina and Boudha monks helped to keep the place of the city intact. The Kashi Vishweshwar temple as we see it now was built by Ahalya Devi Holkar in 1777 AD. In 1785 AD, the then King of Kashi, Mansaram and his son Belvant Singh built many more temples near Varanasi. In 1755 AD, the Avadh pantof pratinidhi (representative) got the old temple of Bindumadhava repaired and renovated it beautifully. The kalabhairava temple was built by Srimant Baji Rao Peshwa in 1852 AD. King Ranjit Singh had the Kashi Vishwanath temple towers covered in gold. A huge bell hangs in the temple. It was donated by the King of Nepal. Surrounding Saranath, there are many Budhhist stupas, Viharas and Chaitra grihas. In 1931 AD the mahabodhi society had built a very beautiful Buddha temple in Saranath. The Hindu devotees visit Kashi to make offering. Here they perform many rituals and consider themselves blessed. Along side, several foreign tourists visit this place regularly. Places worth seeing include Ghats, temples, tapobhoomi and the scenic beauty of the surroundings. Kashi Kshetra and Sri Vishweswara JyotirLinga are connected as the holiest shrines in the world. The Ganga water here is considered as the nectar of the earth. Dying in Kashi or performing the final rites is considered as the way to the Heavens. Kashi - Rameshwar(1) yatra is the prime pilgrimage for the Hindus. The Temple opens daily at 2.30a.m. in Mangala Aarati 3 to 4 a.m. ticket holders are permitted to join. From 4 to 11 a.m. general Darshan is allowed. 11.30 to 12 a.m. mid day Bhog Aarati is done. Again 12 noon to 7 p.m. devotees are free to have darshan. From 7 to 8.30 p.m. evening Sapta Rishi Aarati is done after which darshan is again possible uptill 9 p.m. when Shringar/Bhog Aarati starts. After 9 p.m. Darshan from out side only is possible. Shayana Aarti starts at 10.30p.m.The Temple closes at 11p.m.